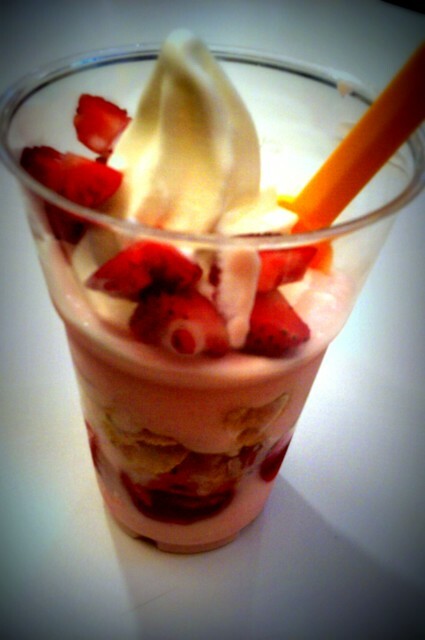 Strawberry parfait comes with fresh strawberries and cornflakes. I usually don’t like these kinds of desserts when they are too sweet, and the Red Mango strawberry parfait is just on the edge of ok. Their yogurth is actually quiet good, but they put a layer of jam in the yogurth. They’re actually a South Korean chain that was established in Bangkok in 2007, and new shops are constantly popping up in different parts of town. The yogurth is low-fat, and it’s tailored at those who have a sweet tooth but don’t want a sugar bomb. Of course, there’s still lots of “hidden sugars” inside (yes, the yogurth might be low fat, low sugar, but what about the sticky jam, etc?). But overall, it’s still a lot healthier than most of the American frozen yogurth places that use sugars in much larger quantities. They also have different kinds of jelly desserts, which are popular with Thai people, and flavored shaved ice desserts and smoothies.